Just like its predecessor, 10 Cloverfield Lane arrived out of nowhere and made us put together tiny clues. But with the footage that aired during the Super Bowl, we think we’ve finally got a handle on it. You can watch it all here, but what stands out immediately is that for movie with a cast of three, two of them show up a lot and one barely at all. Her run takes place at dawn, so either she’s just been found by Goodman or she’s been running for a while. Or this is from later in the film and is one of her escape attempts. It’s unclear. I think it’s probably related to the first shot, since Winstead wears a tank top in almost other scene we see and is only in a jacket in the crash and here. But the lighting on this scene makes it impossible to confirm to 100 percent certainty. “I focus on being prepared,” says Goodman. A line which plays into the synopsis idea that Winstead’s character thinks she’s been abducted by a prepper. Winstead wakes up in the dingier part of the bunker, given that we see the rest of it is furnished and carpeted. This seems less like a fall out shelter and more of a prison. Here’s the first indication that there are more characters than Goodman and Winstead are in this film. John Gallagher, Jr.’s got a cast. And the use of the grate for the vent references something else we see in the trailer. Winstead makes a makeshift weapon. The room shakes and the warning light goes off. The grate shot, this one, and the repeat of the shaking room is all we see of Gallagher in this footage. I’m pretty convinced there are two stages to this movie: Winstead captured by Goodman and trying to get away from his fake “chemical spill” line AND whatever happens after the actual disaster that brings Gallagher down into the bunker with them. The lighting of the scenes with all three—and the different outfit Winstead’s wearing—really reinforce that idea. See, here she is in the vent. Trying to escape or fixing something? Winstead’s got a bundle of stuff and is running right into a fire. We see an explosion later that might be related to this. From the cement walls and the sheets, this looks like where Winstead wakes up, earlier in the trailer. Also a sign that things aren’t good for her. she attacks Goodman with a broken bottle. I’m going to do something I rarely do in these breakdowns. I’ve taken the scene of Goodman opening the Swamp Pop from earlier in the trailer and put it down next to a scene from much later in the film. Above, so can see an unopened bottle of the same drink in the scene where Winstead attacks Goodman. These two very much look like they come from the same sequence. Here’s an explosion. Of what, I can’t tell. Her car? A desperate run from Winstead. Note that the living room set is not on fire in this one. This is the only shot of a hazmat-like mask, which is probably related to Goodman telling Winstead that he’s keeping her down in the bunker after a “chemical spill.” It could be what Winstead is carrying when running into the fire scene. Naturally, she might want to put the mask on so she can escape. It looks like Winstead got out in the hazmat suit—notice the red and rubbery parts that look like a match for the mask we saw earlier—and discovered that she didn’t need the mask. But something else is coming up over the house. We hear a roar and see a bright light, which could mean that the ending of Cloverfield is the disaster that sends her back. Cloverfield had a bomb go off and the monster roared at the end. 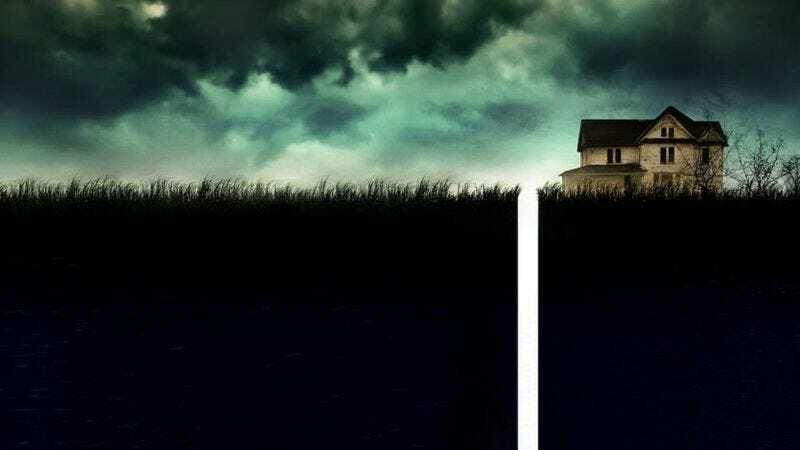 If 10 Cloverfield Lane takes place nearby, in the same universe, then we have the connection between the two that J.J. Abrams spoke about.